Over usage of humor, uneven pacing midway and later struggles to set up a third act. From a failed experiment that started an epidemic, wiped out millions of the human population, followed by a post-apocalyptic world, where Caesar finds himself in a war within himself and in the human race. The title of the third installment may mean something huge but the story it goes beyond the title and rather something deeper and human. War for the Planet of the Apes follows Caesar’s and his ongoing battle and faced a lot of loses from the infamous colonel and as the stakes go higher for the leader of the apes, he is also on his own battle against his inner demons. What makes this film as compelling as the first two is that the narrative sticks closely to the storytelling elements, the themes and most of all Caesar’s character from being a test subject to the charismatic, compassionate leader of its own kind. The established plots such as the impacts of the virus, the human and ape conflict plays the huge part of the story and unveils its repercussions, coming into full circle. There were many themes revolving the film such as survival, struggle, evolution and a bit of pessimism while these seem to sound crowded, there’s this essence of humanity that connects these together and gives us a broader understanding through these characters, whether apes or human, that need of being live, their utter motivation. Visually, the elaborate landscape, shifting from forests, tundra and mountainous terrains along with cold, windy and rainy landscapes gives that huge scale in a post-apocalyptic world and at the same time, it’s nuanced in a sense that it reflects on the outcome of the virus and the never ending conflict, that will leave you haunted – bizarre, eerie all that unimaginable things possible. 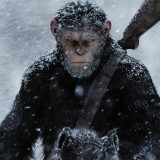 Caesar’s third outing is utterly monkey business, this is where he fully embraces his leader inside him and holds no bars – ruthless, terrifying, broken and at the same time, he’s got this empathy that makes him respectable, that desire to survive and give way to others is what drives him and becomes resilient. Andy Serkis’ wonderful performance: voice, mannerisms, and basically his eye for detail on motion capture is astounding that you forget his suit but rather acting, he’s always in the moment every time the camera points at him. His monologue alone in the first release in the teaser, that straight stare just gives me off chills and admittedly gives me nightmares up to this day, it’s probably a testament of his immense acting chops combined with motion capture skills. The new additions to the cast, Steve Zahn’s charming, naïve and funny Bad Ape and Amiah Miller’s Nova adds a lightheartedness necessary to the bleak atmosphere, every scene they’re in brings that warmth and sigh of relief. Woody Harrelson’s The Colonel is genuinely brutal, ruthless and cold but at the same time, he projects a subtle loneliness that proves that’s more than just a moustache twirling villain: pointing out a gun to Caesar and utterly vocal towards his hateful (justified) hateful rhetoric towards apes, simply put he just lets loose and never holds back. With a wide range of performances he’s done in the past, mentor figure, father figure and playing a villain, Harrelson projects truth in every role he plays. The shortcomings overall were the inconsistent narrative structure as seen during the second act struggling to set up the third act where the Colonel and his forces confronts another human army force, it seemed shoehorned, there wasn’t any buildup but with a backstory explained and their motives briefly mentioned which was to keep off the diseases being mentioned, it would’ve been better if that latter part of the second act was used to set up The Colonel’s incoming enemy. The humor while a it’s a good contrast on the film’s bleak tone loses its purpose when repeatedly done and sloppy though it shows the director’s ability to pull off humor well in a a very serious, brooding bleak film. 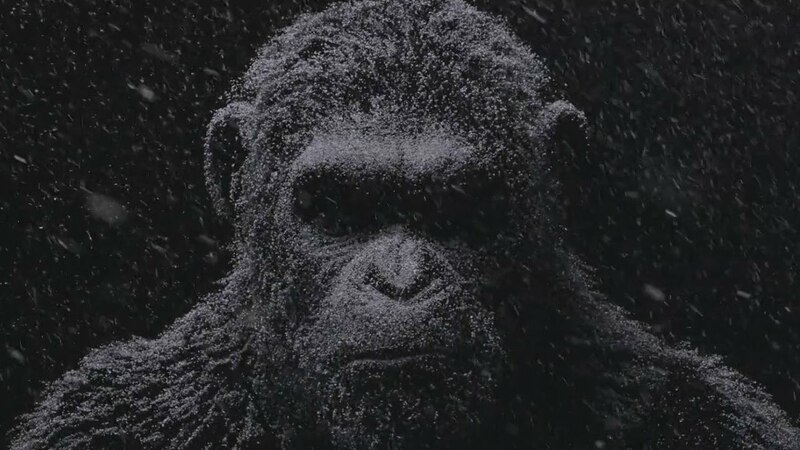 That being said, the narrative structure may not be perfect however but is overshadowed by such a rich storytelling but still a strong and solid Apes film. Performances and Matt Reeves’ directing skills which showcases intimate, human, he manipulates all aspects of filmmaking and turns it into a grandiose spectacle of humanity. 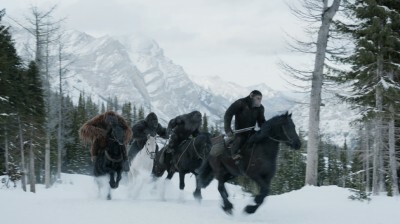 War For the Planet of the Apes Comes Out in July 12 Cinemas. Special thanks to 20th Century Fox PH for the invite! REVIEW: The 80s Return in Ready Player One!